Jarvis, Judice & Ninke Dithering (henceforth referred to in this article as simply "Jarvis Dithering") is a method of dithering which tends to produce effective results with relatively few repeated pattern artifacts. Jarvis Dithering tends to produce coarser patterns than the better-known Floyd-Steinberg Dithering method, but with less artifacts. Jarvis Dithering is closely related to Stucki Dithering, but Jarvis Dithering is slightly more processor-intensive, and images produced with Jarvis Dithering tend to be slightly more blurred than those produced using Stucki Dithering. 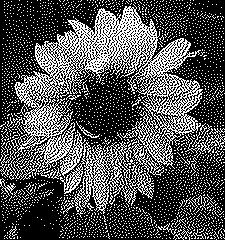 Jarvis Dithering can be can be used for both black and white images, and for color images. The main disadvantage of Jarvis Dithering is that it is relatively processor intensive, and therefore can be slow for the compuer to perform on large areas. Jarvis Dithering can also be used when reducing the color depth of an image. For example, when converting True Color image into a color-safe palette image, Jarvis Dithering can be used to avoid large smooth areas of color which would otherwise spoil the photographic effect of an image.